Virdon attended an open tryout held by the New York Yankees in Branson, Missouri, and scout Tom Greenwade signed Virdon to the Yankees for a $1,800 signing bonus ($17,734 in current dollar terms). Virdon made his professional debut in 1950 with the Independence Yankees in the Class D Kansas–Oklahoma–Missouri League, and was promoted to the Kansas City Blues in the Class AAA American Association for the final 14 games of the season. Virdon played for the Norfolk Tars in the Class B Piedmont League in 1951, and for the Binghamton Triplets in the Class A Eastern League in 1952. The Yankees assigned him to Kansas City in 1953, but he struggled, batting .233. While he played in Kansas City, Virdon was diagnosed with astigmatism. When Kansas City manager Harry Craft noticed Virdon reading while wearing glasses, Craft told him to wear them while he played. The Montreal Expos hired Virdon as their manager before the 1983 season, replacing Jim Fanning, and signed a two-year contract. During the 1984 season, Virdon expressed his to Expos general manager John McHale that he did not want to return to the Expos in 1985. With a 64–67 record in August 1984, the Expos fired Virdon during the 1984 season, replacing him with Fanning. Gary Lucas, a pitcher for the Expos, felt that they had lost many one-run games because Virdon was too conservative in his managing, not employing the hit and run play and relying on the starting pitcher for long in the game. 1 2 3 4 5 6 7 8 9 10 11 12 13 14 15 16 17 18 19 20 21 22 23 Wolf, Gregory H. "Bill Virdon". Society for American Baseball Research. Retrieved February 26, 2016. 1 2 Welch, Anvil (July 14, 2013). "Virdon selected for Independence baseball shrine". Joplin Globe. Retrieved February 27, 2016. ↑ Broeg, Bob (April 3, 1955). "If Astigmatism and Cracked Knee Didn't Stop Virdon, What Can?". St. Louis Post-Dispatch. p. 26. Retrieved June 22, 2016. ↑ "Cards' Virdon Good Bet For Rookie Of Year". Sarasota Herald-Tribune. United Press International. June 10, 1955. Retrieved February 28, 2016. 1 2 3 "Bill Virdom Top Rookie". Ellensburg Daily Record. Associated Press. December 3, 1955. Retrieved February 28, 2016. ↑ "Bill Virdon Signs For 1956 Season With Cardinals". The Southeast Missourian. Associated Press. November 22, 1955. p. 8. Retrieved February 26, 2016. 1 2 Walfoort, Cleon (September 20, 1956). "Bill Virdon of Pirates Now Looms as Batter Aaron Must Beat Out". The Milwaukee Journal. p. 17. Retrieved February 28, 2016. ↑ Richman, Milton (September 23, 1974). "Bill Virdon is shaping up real fine". The Dispatch. Lexington, North Carolina. United Press International. p. 10. Retrieved February 26, 2016. ↑ "1956 National League Batting Leaders". Baseball-Reference.com. Retrieved February 25, 2016. ↑ "1959 National League Fielding Leaders". Baseball-Reference.com. Retrieved February 26, 2016. ↑ Schoenfield, David (January 28, 2016). "The best defensive teams of all time". ESPN.com. Retrieved February 28, 2016. ↑ Kevin Flowers (October 13, 2010). "1960 World Series Game 7 a 'life-changing experience' for players". Pittsburgh Tribune-Review. Retrieved February 26, 2016. ↑ "1960 World Series Game 7: The greatest game ever played". ESPN.com. Retrieved February 26, 2016. ↑ "1962 National League Batting Leaders". Baseball-Reference.com. Retrieved February 26, 2016. ↑ Hernon, Jack (November 17, 1965). "Virdon Retires as Pirate Centerfielder". Pittsburgh Post-Gazette. p. 28. Retrieved February 28, 2016. ↑ Biederman, Lester J. (November 17, 1965). "Bill Virdon Retires As Player And Looks To Managing Career". The Pittsburgh Press. p. 73. Retrieved February 26, 2016. 1 2 3 4 Shrum, Rick (October 6, 2002). "After 53 years, Virdon cuts back on baseball". Pittsburgh Post-Gazette. Retrieved February 26, 2016. ↑ Snider, Steve (December 13, 1955). "Cards' Virdon Fast Operator: St. Louis Star Goes From Rookie to Teacher in One Year". The Milwaukee Journal. United Press International. p. 2. Retrieved February 26, 2016. ↑ "1966 Williamsport Mets". Baseball-Reference.com. Retrieved February 26, 2016. ↑ "1967 Jacksonville Suns". Baseball-Reference.com. Retrieved February 26, 2016. 1 2 Chick, Bob (February 17, 1972). "Brown: Virdon Had To Be Our Man". The Evening Independent. p. 1-C. Retrieved February 26, 2016. ↑ Basnett, Chris (April 3, 2014). "Virdon throws first pitch for Cards". Springfield News-Leader. Retrieved February 27, 2016. 1 2 Mihoces, Gary (September 7, 1973). "Danny Murtaugh Returns As Manager Of Pittsburgh Pirates; Bill Virdon Is Fired". Gettysburg Times. Associated Press. p. 11. Retrieved February 28, 2016. ↑ "Richie Hebner Won't Apologize to Virdon". Associated Press. August 14, 1973. p. 16. Retrieved April 10, 2016. ↑ "Bucs' Virdon Is Replaced By Murtaugh". The Telegraph. United Press International. September 7, 1973. p. 11. Retrieved February 26, 2016. ↑ "Virdon Is Yankee Manager". Washington, Pennsylvania. Associated Press. January 4, 1974. p. B-2. Retrieved April 10, 2016. ↑ Richman, Milton (January 2, 1974). "Yankees Give Up On Williams, Hire Bill Virdon As Manager". The Dispatch. United Press International. p. 7. Retrieved February 26, 2016. ↑ "Bill Virdon Gets The Last Laugh". Beaver County Times. United Press International. October 25, 1974. p. B-3. Retrieved February 26, 2016. ↑ "Bill Virdon Signs 2-Year Yankee Pact". Gettysburg Times. Associated Press. October 25, 1974. p. 14. Retrieved February 26, 2016. ↑ "Bill Virdon Shrugs Off Death Threat". The Pittsburgh Press. United Press International. May 30, 1974. p. 40. Retrieved February 26, 2016. 1 2 "Bill Virdon Replaces Gomez". The Nevada Daily Mail. Associated Press. August 20, 1975. p. 11. Retrieved February 26, 2016. ↑ "Houston's Bill Virdon Named Top National League Manager". Herald-Journal. Associated Press. November 18, 1980. p. B2. Retrieved February 28, 2016. ↑ "Bill Virdon gets the ax". Bangor Daily News. United Press International. August 11, 1982. p. 15. Retrieved February 26, 2016. ↑ "Astros Fire Bill Virdon As Manager". Gainesville Sun. Associated Press. August 11, 1982. Retrieved February 26, 2016. ↑ "Expos Name Bill Virdon". The New York Times. United Press International. October 13, 1982. Retrieved February 26, 2016. 1 2 "Expos: Virdon out, Fanning in". Beaver County Times. Associated Press. August 31, 1984. p. B4. Retrieved February 28, 2016. ↑ "Expos, Virdon agree: it's time for a new boss". The Spokesman-Review. August 31, 1984. p. 22. Retrieved February 26, 2016. ↑ Prisuta, Mike (December 18, 1985). "Roberts, Bonilla may be returned". Beaver County Times. p. C2. Retrieved February 26, 2016. ↑ "May Replaces Virdon". Sarasota Herald-Tribune. November 12, 1986. p. 4C. Retrieved February 26, 2016. 1 2 3 4 Perrotto, John (October 30, 2000). "Virdon couldn't say no to Bucs' bench job". Allegheny Times. pp. B1, B5. Retrieved February 26, 2016. ↑ "Bill Virdon interviews for Marlins' job". The Tuscaloosa News. Associated Press. p. 5C. Retrieved February 26, 2016. ↑ "At the starting line". The News. September 27, 1992. p. 4D. Retrieved February 26, 2016. ↑ "Lachemann to become 1st Marlins manager". Ocala Star-Banner. Scripps News Service. October 22, 1992. p. 1C. Retrieved February 26, 2016. ↑ "Baylor named Rockies manager". Bangor Daily News. Associated Press. October 28, 1992. p. 9. Retrieved February 26, 2016. ↑ "Virdon to talk to Orioles". Beaver County Times. September 28, 1994. p. B2. Retrieved February 26, 2016. ↑ Meyer, Paul (October 31, 2000). "Virdon rejoins Pirates' staff: Former manager, player hired as bench coach for McClendon". Pittsburgh Post-Gazette. p. D-1. Retrieved February 26, 2016. ↑ Karen Price (June 19, 2012). 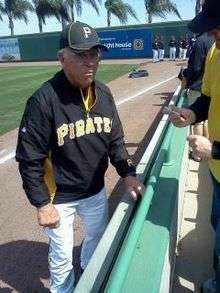 "Mazeroski, Virdon serve as Pirates' coaches". Pittsburgh Tribune-Review. Retrieved February 26, 2016. ↑ Kaduk, Kevin (June 21, 2012). "MLB bounces Bill Mazeroski and Bill Virdon from Pirates dugout after one game". Yahoo! Sports. Retrieved February 26, 2016. 1 2 Balog, Tom (February 27, 2013). "Virdon left his mark on Casey Stengel". Sarasota Herald-Tribune. Retrieved February 26, 2016. 1 2 "Former major leaguer endows scholarships". The Southeast Missourian. February 17, 2007. p. 3B. Retrieved February 28, 2016. ↑ Feeney, Charley (March 3, 1972). "A Day in the Baseball Life of Bill Virdon". Pittsburgh Post-Gazette. p. 21. Retrieved February 28, 2016. ↑ "Hall Names Virdon Missouri Sports Legend". KOZL-TV. May 17, 2012. Retrieved February 27, 2016. ↑ Booher, Kary. "Herzog: Plans to press Springfield's Virdon for Cooperstown". Springfield News-Leader. Retrieved February 26, 2016.